Creating a cabin style cottage with an interior that looks carefree and inviting is exciting. For a home to have a rustic look with log cabin style interiors is like creating a dream house with all the aesthetics of a farmhouse. The log cabins look dreamy with the beautiful interiors and warm lighting creating an impact on the wooden logs. It is necessary to use many effective designs with more of the same wooden tones throughout rooms to give the place a simple and rustic look. The beautiful staircase made of logs and positioned well inside the living room complements the other rooms in the house. Decorating the home interiors with wooden and simple décor with an earthy color scheme with cozy and rustic textures adds to the rustic appeal. The rooms can be painted or colored with neutral colors to give the place a contemporary look with the woody feeling. The home with wooden walls and beams and felt ceiling panels give the place a rustic appeal. The felt wall covering and the hanging felt panels add to the trendy style for the interiors of the house. The wooden walls with the exposed log beams look elegant and appealing. The light interiors help to give natural look to the exposed wooden beams. The felt partition and the wooden staircase adds to the natural look of the place. The felt for walls gives the place a rustic log cabin appeal. The furniture for the log cabin style home should be kept simple and unpolished. The tables and cabinets made of unfinished and unpolished wood give a rustic appeal to the log cabin. The light color sofas balance the harsh features of the rustic look. The vintage rug makes the living room look warm and cozy. The wooden stools with the coffee table add to the simple and elegant furnishings. Wooden cabinets and floating shelves can be added into the corners for storing and displaying things. A wooden bookshelf in the corner can be added for the books. The beds in bedrooms with big wooden frames go with the rustic theme. The cozy built-in wooden bunks are great for the log style cabin bedrooms. The dining table kept near the windows gives a beautiful view of the outdoors. The wooden cabinets and the table tops match the color palette of the rooms. The contemporary look is to combine various styles and fill the gaps amicably to make the place look welcoming. Large windows in the rooms give a beautiful view of the place and also helps with natural light to play with interiors giving the place a nice cozy look. The large windows help to enhance the outdoor feel within the home. Creating a cozy seating space near the window with colorful cushions makes the place look inviting. The log cabins or homes are not complete without the traditional brick stone fireplace. The brick stone fireplace and wood area are a common feature of log cabin style homes. The fireplace adds to the warm and coziness of the home. In fact, the living room with the fireplace is the coziest place in the entire home. The fireplace mantle can be decorated with photo frames, candles, and colorful wreaths. The entrance of the log cabin style home can be complemented with a barn door. The barn door at the entrance gives a rustic appeal to the place. The entrance can be decorated with wire baskets and lanterns along the aisle. We can add a wreath made of artificial flowers on the barn door to add some color to the place. The antique metal trunks add to the rustic vibe of the place. The antique trunks can be used as a storage for various things at home. It can be used for storing linen, quilts, bedcovers, and other items. Placing a vintage trunk in place of a table adds to the cabin style look. The trunks can be decorated with accessories like wire baskets, candles, and another vintage décor. The top of the wine barrel can be used as a tray for displaying antiques and accessories. The lighting fixtures on the wall create an impression within the room. The subtle lighting gives warm look and creates an inviting ambience to the home. The lighting fixtures should be good so that it enhances the look of the wooden interiors of the home. Hanging a chandelier in the open space from the ceiling makes it the focal point inside the room and gives the cottage a modern look. The lights fixed within the beams and the wall along with beautiful lamps and candles illuminate the place and make the place look bright and welcoming. The pictures and art in their respective frames complement the rooms well and gives the place an aesthetic appeal. The colorful paintings and artwork add color to space and covers the walls well. The artwork with landscapes and nature sets the tone for the cabin style theme. Photo frames look good when they are made from wooden wall hangers for complementing the rustic look of the room. Vintage lamps and clocks also look good for a rustic décor for the living room. The living room décor can be enhanced with antique accents and wreaths made of branches and ferns. Decorating a log home involves a lot of creativity with imagination for creating a place which is simple, aesthetic and rustic in appeal. Creativity is using a lot of rustic materials for designing the interiors effectively, for adding stylish decor to the home, while perfectly complementing each space. The interiors for log cabin interiors have a lot of elements that contribute to their natural and rustic looks. Since wood happens to be a natural insulator, therefore the interiors of the homes are well protected from the exterior environment. 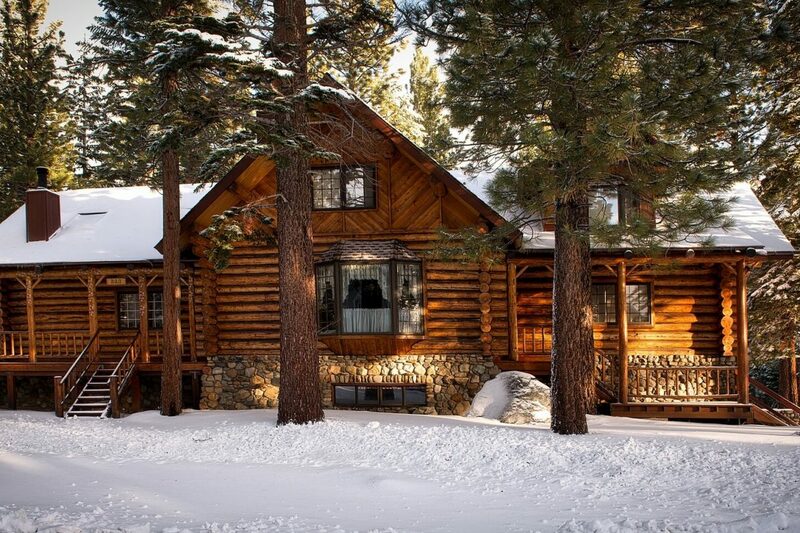 The log cabin homes can be styled aesthetically and made to look welcoming for the family and friends. The important element of rustic style décor is to mix quality with style to make it functional and give the place a welcoming look.